Good Health: While kiddos are excited for the upcoming holidays, remember that some little ones are spending the season in the hospital. Have your children make and send special greeting cards to a local children’s hospital as a way to brighten their young patients’ day! This will also remind them that despite the sniffles and colds that they might catch this season, there are children who are fighting much more serious battles. Warm Meals: Many families struggle to get wholesome food on the table this season, so when your little ones complain about eating their “icky” veggies, remind them that some kids aren’t lucky enough to have a healthy meal on the table every day. There are plenty of ways your family can help others in need, though! Volunteer at a local food bank with your older children, while younger ones can help cut out manufacturers’ coupons (fine motor skills at work!) that you can gather together for a family in need. Many homeless shelters and food banks accept coupons, but call the location ahead of time to be sure. Lastly, while at the dinner table, make it a ritual for each family member to share something they are thankful for. This will keep them feeling grateful even after the holidays are over! Comfy Clothes: If this winter is anything like the last, warm winter clothes will be used to the max. This also means that less fortunate kids will be in need of plenty of coats, sweaters, and other cozy apparel. Work with your children to gather together gently used clothes and boots to donate to a local homeless shelter or Salvation Army. When they learn that their fuzzy sweater will help another child stay warm this year, they will learn an invaluable lesson in gratefulness! Toys and Books: How many unused toys and books do your little ones have lying around the house? Probably too many. Talk with them about how happy they were when they received those toys and that they can help a less fortunate child feel that same excitement by donating them. Remember: if they aren’t ready to donate a book or toy, it’s okay! Don’t force it. Gently remind them, though, that they can show thanks for the many toys they do have by giving some of them to families in need. Family and Friends: It’s not just kids that might forget to thank their friends and family for always being there. 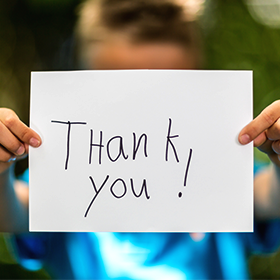 Create hand-made “thank you” notes with your little ones to send to the special people in your lives. It’s an excellent way for kids to practice handwriting and art skills while remembering how many special friends and family members they have in their lives!